Discussion in 'UFOs, Aliens, Monsters, and the Paranormal' started by Mick West, Feb 14, 2014. 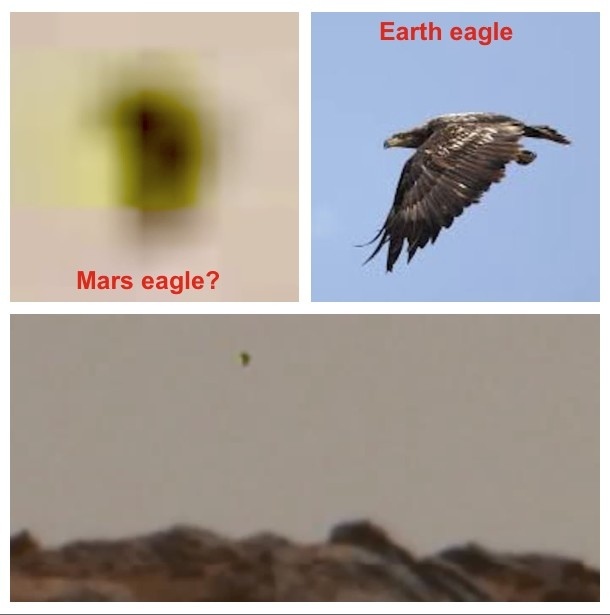 This image claims to show a "giant bird" shaped object on Mars. 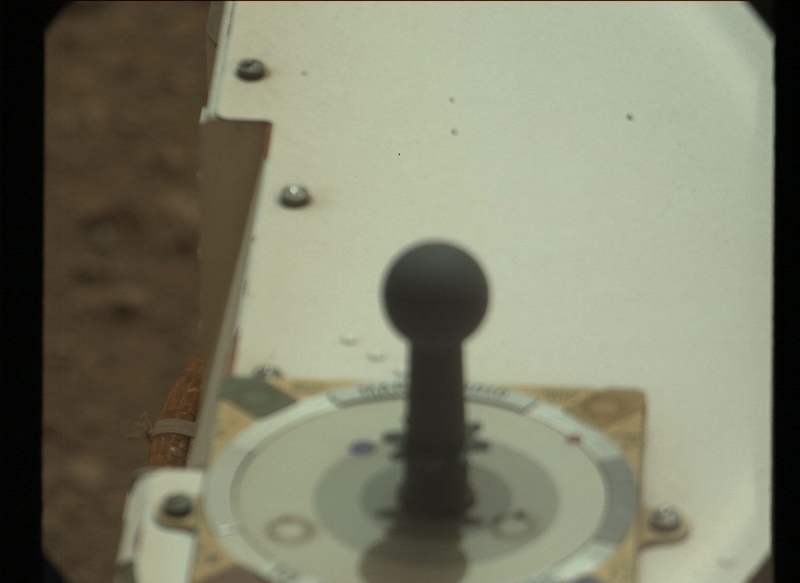 The image is actually there, however it's just some defect on the sensor in the Rover's camera (probably a speck of dust). You can prove this by noting that the same image appears in the same position in each individual image that makes up the stitched image. 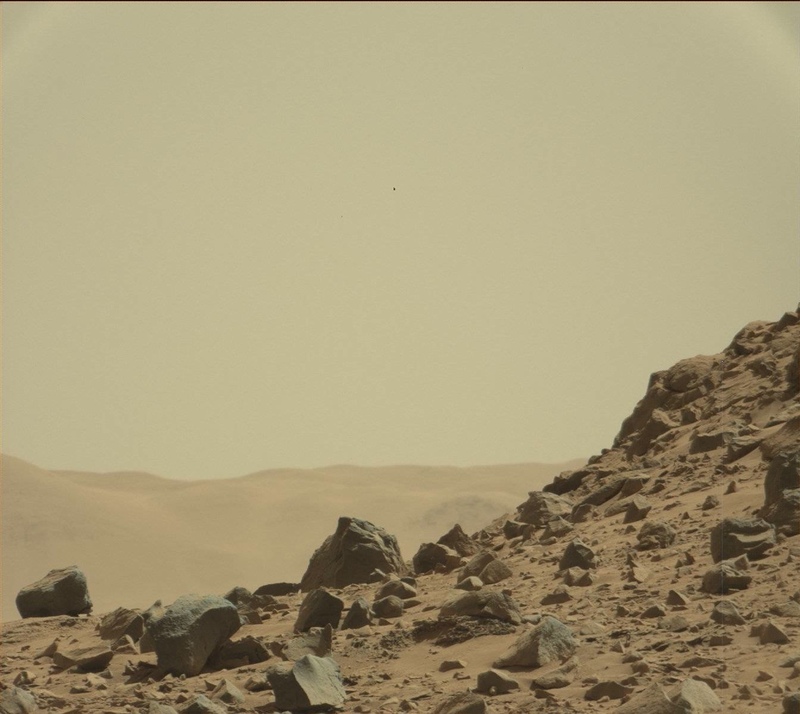 This image was taken by Mastcam: Right (MAST_RIGHT) onboard NASA's Mars rover Curiosity on Sol 540 (2014-02-11 21:54:51 UTC). Since this is not a RAW image, it's JPEG compressed, which accounts for 8x8 block of shimmery pixels around the bad pixels from the camera's sensor. The original image comes from the Blog "UFO Sightings Daily", who are perhaps a little lax with their quality control, having to get a new "UFO" out every day. Hi Mick. Any idea from looking at previous images whether these pixels have been stuck for a long time, or is this a recent development? So (assuming all pictures were captured and displayed with the same settings), if they are all overlaid over each other, the stuck pixel will lie over itself? It's been like that from the start. I've added a Sol 13 image to the OP. Yes. Its the exact same pixels in each original image. If you spend any time on "UFO Sightings Daily" you quickly realize that its owner, Scott Warring, identifies most rocks, shadows, and anything he cant identify as UFOs or aliens.I used to visit his site for the laughs but after a while it just gets kind of sad. He believes what he post. 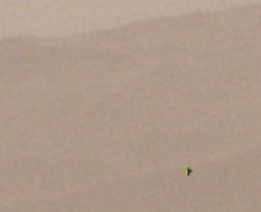 Does anyone know if you can get an uncompressed image from the Mastcam (Right)? I'm curious as to what the actual pixel pattern looks like. JPEG compression is available in real time during acquisition of footage. During mission operations however, images will be stored raw and compressed just before being downlinked to Earth. 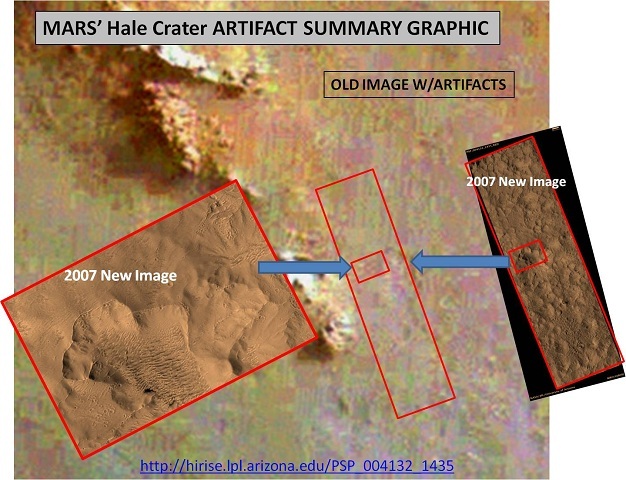 JPEG compression artifacts can be very interesting they can lead to misconceptions by the unsophisticated viewer . . there are many examples regarding Mars . . . for example below . . . This isn't really a JPEG thing thought, that just gives it slightly more interesting shape. The real issue is that there's a camera defect that creates this same little image in the same spot each time. Yes. It means they can sent raw images, but they will generally send compressed images. So there are probably some true raw images somewhere. this blob could be the same thing ( I think it looks like a turtle with a jetpack) last image on page. I know it wouldn't be raw then but may show its not just an on mars thing? It's just dead pixels, which is not at all uncommon as pretty much all CCD cameras have them. Scientists with the Space Telescope Science Institute have even produced tables/maps of bad pixels on the Hubble Telescope's WFC3/IR camera. Yes, that the same thing. So they shipped with the bad pixels. 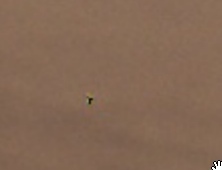 I think it's most likely a slightly larger physical defect than just bad pixels, like some dirt stuck to the sensor. Notice how the defect (above the red sign) looks just like a bit of dirt on your screen, with the animation. You can see another smaller bad area, down and to the left. It's not actually in-camera raw though, just JPEGs. I now await a CT site claiming that NASA secretly sent Donatello on the mission to sample Mars pizza. 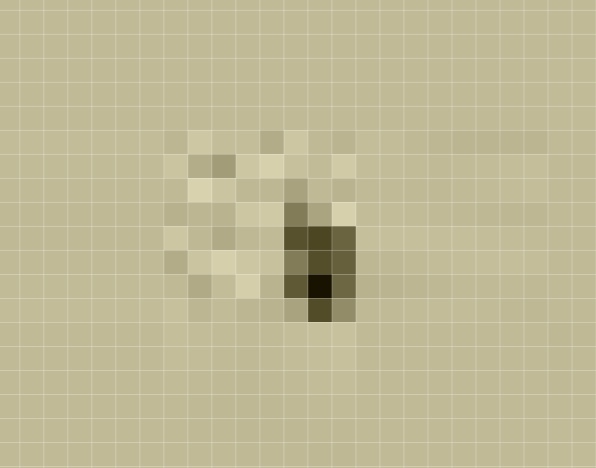 It's interesting that these pixels are interpreted as a bird, but the actual bird flying across the face of the moon is interpreted as a giant boomerang-shaped spaceship. Some people just tend to leap to the most interesting explanation, and not the most likely. That has always puzzled me as well. Several years ago when they were moving a very large substation transformer in California the UFO crowd was abuzz claiming that it was a crashed UFO. Even when I went to the trouble to post the picture and the trade story about where it was going and where from they would not believe it. Shill again I was so I was told. the University of North Texas has been the "Mars Green Eagles" since the '60s! Yes, unsophisticated viewer is a perfect interpretation of just about all of the posts in ufo sightings daily? It is amazing what ones imagination can make you think is real! It never seems to end. So, so many silly, silly claims based on what? In a way, it's somewhat humorous, perhaps even "cute"...like when a child asks an innocent question about "the Tooth Fairy". But, the age of the Internet allows a very diverse, and heretofore unknown segment of the truly mentally deluded access to post their nonsense...and, of course, some tend to then "follow" them. Staying on the topic of Mars, and this thread...I don't know if it's worth sharing, and giving these videos extra "views", but...maybe so, just in case not everyone has seen them, as examples of a very, very mentally disturbed individual: YouTube name "Dave Stacey". Again, just two examples. And, noting that either originally, or due to many negative responses, these videos cannot be commented on, and "Ratings have been disabled". Yet, 5 years on, they still are available to view, on YouTube. "Dave Stacey" presents a wonderful avatar, on this YouTube Channel...but, well. I am just dumbfounded, sometimes. Is this serious? I am under the impression it is in jest. Personally i do not see tiny anything in the photos. 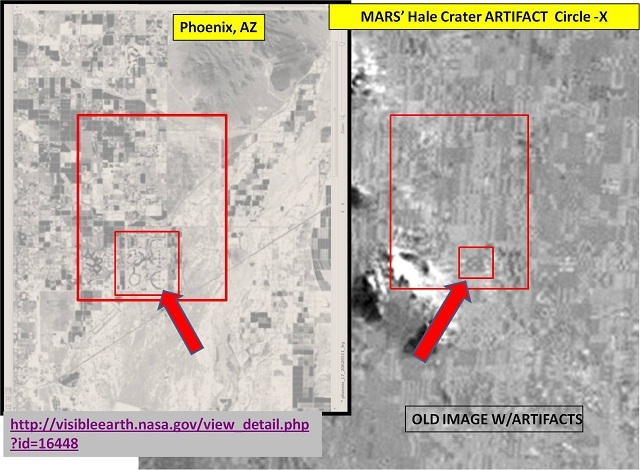 If indeed this is real there is a great collaborator for Scott Waring waiting out there to find other non existent items in Martian photographs. Funny this post does not see tiny cryogenic squirrels? Also makes no mention of the numerous destroyed statues of various alien species who once ruled the red planet. Maybe someone can point out where exactly the tiny humans and apes are in the photos? There is a remote possibility thAt there indeed could be such organisms living on CO2! May I ask, "Skaredstiff", if you are referring to my post just above, or to the OP of this thread? They're guaranteed hit-magnets, so they're unlikely to end. It may almost be an industry of sorts. Your post. I can not see what the poster references as tiny humans? Possibly the YouTube video lacks resolution to reveal what Dave thinks he sees. As far as the premise if the thread I am impressed with the very thoughtful and well presented demonstration if what appears to be exactly what is seen. Dead pixels. I am sorry to have started what appears to be a "firestorm" of sorts. I was more interested in a discussion about the ability of people to infer what is actually a form of pareidolia, and then attempt to pass off that particular mental illusion/delusion as a so-called "fact". 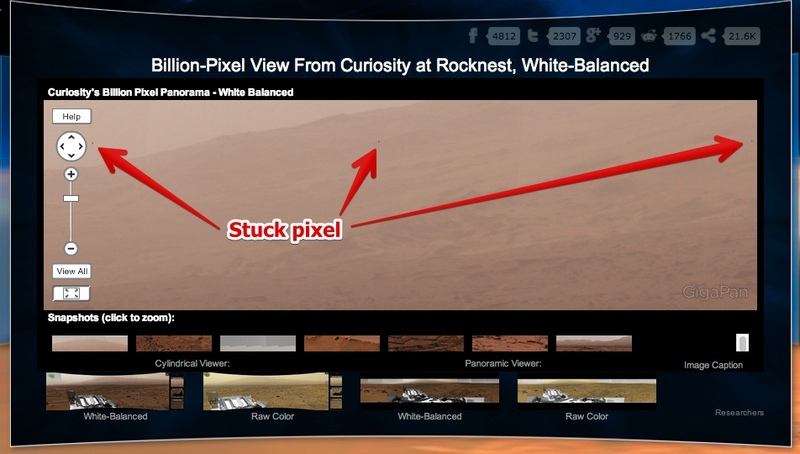 Yes -- the affected instrument is Mastcam Right and the problem was obviously present before the rover even left Earth. 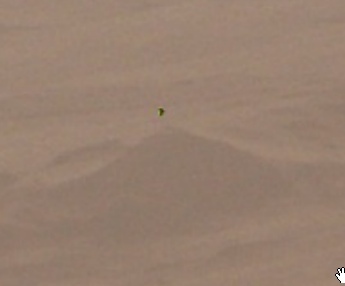 The anomaly -- whether it's a foreign body on the camera or one of its filters, or a physical defect with the cameras CCD itself, can be seen in images that were taken on Sol 3 when they first deployed the mast. It appears no less than 75 times on the horizon in the recent panorama that NASA posted. The colouration of the defect is not typical of hot/dead pixel data, or JPG compression, which has me leaning towards the belief that it's a foreign body of some kind on the hardware. It looks like NASA might need to review their compliance to ISO cleanroom standards. Sadly, Mr. Waring still believes that it is a bird. Well handled, Mick!